So here are just a few photo’s from Christmas. And yes, when I say a few, I literally only mean a few. Spent time with tons of family and friends, and was once again blessed beyond my deserving. It’s been awhile since I’ve really taken the time to fill everyone in on the Dialogue Church plant. Let me first say, it’s been an awesome journey. The journey so far has been short, yet, the future of the journey will certainly be long. The team that I am surrounded with seem to amaze me every week. We “Coffee” You Outreach – This was Dialogue’s first official outreach to let the community know that we are there and that we care. I was reading a blog about how different church’s have “gimmicks” that they use to be different than other church’s. I would agree with that to a point definitely. I don’t know though, maybe each church that has their only gimmick to be “different” felt the same way we did about the We Coffee You outreach. We believed that by giving 1000 people a $5 gift card to Starbucks, that it could offer a community that is so busy a chance to sit down with someone and build that relationship. Take time from their crazy lives, and spend some time to truly “dialogue” with someone. It’s been crazy awesome to watch this outreach come full circle, even after only a week. In-Reach – In-Reach is something Dialogue is passionate about. We will be finding family’s within our own church family that need help. Whether it’s financially, spiritually, house repair, babysitting, or whatever it is. As a church, we will give them our service, our time, our love, and love them in whatever way is needed. Honestly, how can you love people you don’t know, if you don’t first love the people you do know? Trunk-and-Treat – Dialogue will be hosting their first trunk-and-treat. Some of the members of Dialogue will be at Forrest Park with their vehicles, some dressed up, some not, to pass out candy to the kids as they roam the hood in search of all the stuff that dentist’s hate. There also will be games and other activities that will be taking place. Rear Projection – We were finally able to get a screen. Yes, that means no more projecting on the wall. I cannot say how much better it looks. You can actually see what is projected(which puts more pressure on me back in the booth to always be on top of my game…crap). Chairs, Chairs, Chairs – Never knew how much all matching chairs could mean to a ministry. Wow. It makes the service just feel and look a whole lot better. Hospitality – Our hospitality team has been doing a great job. Really. They serve and greet everyone like family. Soon we will be creating a new little sitting area, with some soft lighting, just inside the gym, with two new high cafe tables, a floor lamp, some art work…and if they let me, a medium sized plant(I just believe a plant makes everything feel so relaxed and comforting.). This also will help with the Sunday morning pileup of people in the hallways. I’m sure there is more, but for now that is all I got. If you have not stopped in to check out Dialogue and you are in the area, please do. We would truly love to have you. This is a part of Creative Chaos over at Ragamuffinsoul. Stop in there to check out everyone else’s creativity. What’s exciting that is going on at your church right now?? A lot of creative ideas have been coming up at Dialogue recently. We’ve continued to passionately pursue being different. Not just different to be different. But, we believe in being different because we believe that is what our community needs. Our community needs a church, a body of people, who will pursue their hearts with love and without hesitation. Our community needs a place they can come and know that no matter who they are, or what they believe, that they are welcomed here. Coming up in the next couple month Dialogue will be starting their first major outreach. This outreach is centered around coffee. Everyone loves coffee(especially when it’s free St.Arbucks). To read more about this outreach from the words of our pastor, check out Ryan’s blog here. What is something your church is doing right now to reach the community? It’s been a few weeks since I’ve participated in this friendly thursday activity. My life has been extremely busy and crazy. 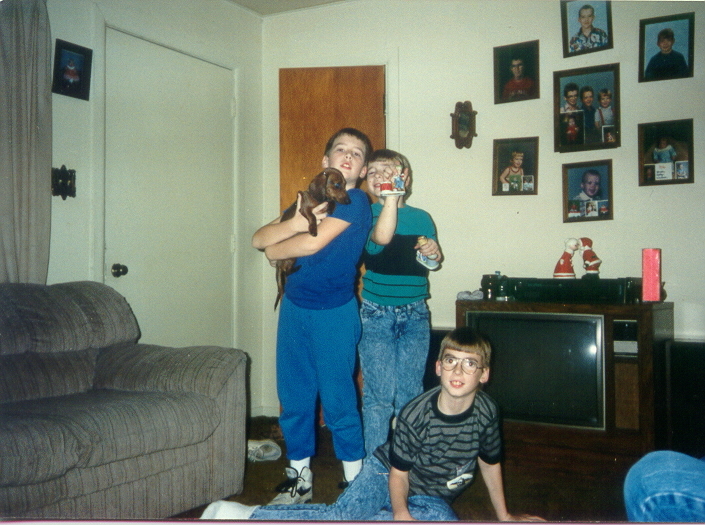 Anyhow, here it is, my brothers and I with our weiner dog which we named, Wee-wee. 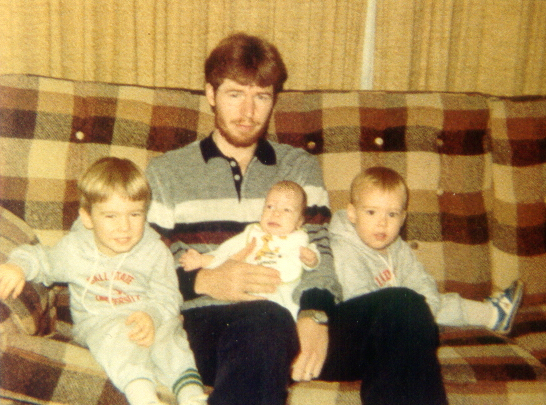 The year is 1990, and I would be the one in the middle with my face half covered. Enjoy! I just want to take a minute and honor all the father’s out there. Thanks for always supporting me, and for guiding me in my relationship with God. You have showed me the importance of hard work and of never giving up. You’ve also showed me the ability of loving and being compassionate. That it’s okay to be broken and soft. Without you, I fully believe I’d most likely be a punk and a jerk. Thank-you Dad…today is YOUR day.